M and I received some pretty great books for Christmas this year. 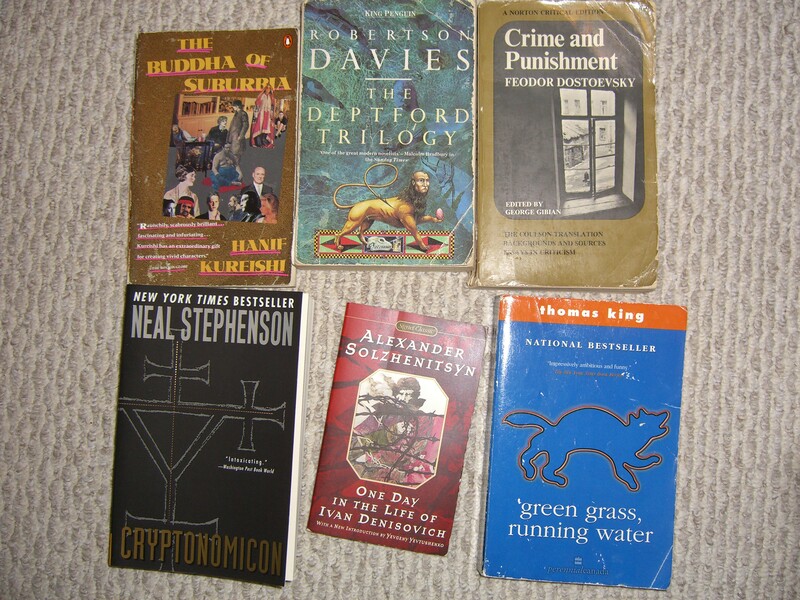 He was gifted some Stephenson and Pratchett, and I, some Murakami, Richler and Mantel. Bliss folks – for us, THIS is bliss. Aomame and Tengo are my new best friends. What happens with me is that, although I read quite a bit, and for the most part, I enjoy everything that I read (and even those books that I do not enjoy, I slog through them anyways. I finally finished Pol Pot: Anatomy of a Nightmare only a couple of months ago, after what seemed to be an on-again-off-again relationship with the book for close to eight months) I tend to go overboard on those works that I do enjoy, like, A LOT. You see, there are some authors that I find so transcendent, that I develop an almost perverse obsession with findingand reading all of their published works, lest I miss out on experiencing everything their genius has to offer. And I really mean everything. The earliest memory I have of this phenomenon is from grade four, when I first discovered the great Canadian children’s author Kit Pearson. I picked up The Lights Go on Again not knowing that this book is in fact the third of a trilogy that explores the journey of two young English siblings’ experiences as war children, evacuated from a (fictional) small town in England and sent to live in the posh Toronto neighbourhood of Yorkville. To say that I loved this book (and then the rest of the books in the series) would be an understatement. I am sure that I read each novel close to twenty times. This fascination with Ms. Pearson’s writing was then transferred onto her other works, The Daring Game and A Handful of Time. So you must understand what a soul crushing blow it was to read her newest work (at the time) when it came out, hot off the presses, and to feel no connection whatsoever with the narrative or the narrator. In fact, I remember despising the protagonist, and feeling utterly morose by both the story’s flaccid narrative arc, and (what I felt to be) rather limp conclusion. To paraphrase Kevin Kline in A Fish Called Wanda, I was DISAPPOINTED. 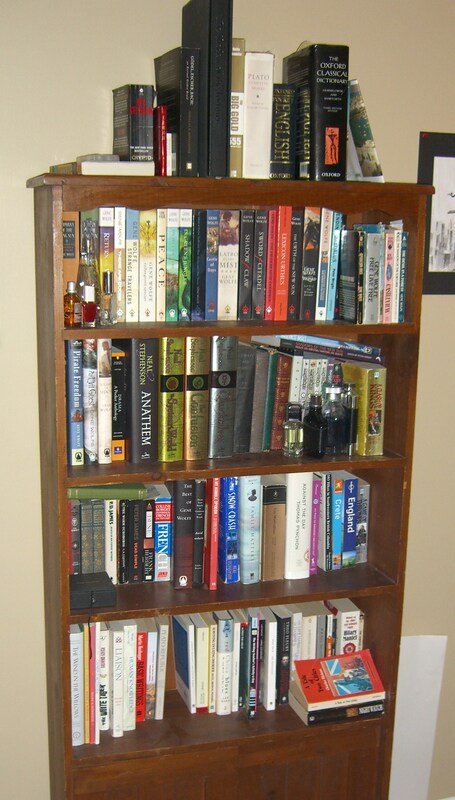 Bedroom bookshelf. Now will more Gene Wolfe. Vampire series, (do I regret this? No. But, erm, next time, I think I may take the left turn atAlbuquerque and forgo any literary adventures with Mr. Lestat), and pretty much everything John Grisham and Michael Crichton had written up until that point. The one big mistake however? Reading Misery. Yeah, not about to get those nightmare filled sleeps back anytime soon! In grade eight I started my five year love affair with Mr. William Shakespeare, obsessing over King Lear’s poor decision making processes, despising young Hamlet and his gutless procrastination, and emulating and loving (and therefore memorizing) Beatrice’s lines and soliloquies. I read every one of his plays, including the ones that that most people probably wouldn’t recognize. However, I am sure that if you asked me right now, I probably couldn’t even remember the simplest of story details of those plays (let alone two hours after I had finished them) because they left no discernable effect on me what so ever. I am sure I decided to read the entire canon not so much due to my burning desire and admiration for the Bard and his words (although this did, and still does very much exist,) but because I was fifteen and thought I was misunderstood and brilliant. When I first met M, he gave me Vonnegut’s Breakfast of Champions to read on the long flight down to Nova Scotia and I almost died with shock and delight within the first few pages. During those next two weeks I inhaled every work of his I could find. As I mentioned before, in first year of my undergrad I read Dostoevsky’s Devils and my brain (metaphorically) exploded all over my room. I gobbled up Crime and Punishment with an almost maniacal zeal, and after that devoured The Idiot and The Brothers Karamazov. I received a lot of strange looks during that time. I could go on at length about all the books that have shook me to my core, but I think it may be impossible, and I really must try to reign myself in. I just get so overwhelmed and confused when I hear that so many people don’t read anymore, and I get panicked and desperate when M tells me that his students at school are hard pressed to even read their assigned passages, let along deign to pick up a novel outside of class. I even get anxious worrying over whether I’ll die not having read all the books I want to read. I just want to create a place where everyone can live peacefully, and where I will read to them from Thomas King, and Neal Stephenson, and Robertson Davies, and Hanif Kureshi, and Gunter Grass, and Terry Pratchett, and George R. R. Martin, and Richard Russo, and, Michael Palin, and Hunter S. Thompson, and Gene Wolfe, and J. R. R. Tolkein, and Robert Heinlein, and Richard Matheson, and Ray Bradbury, and P.D. James and well, this list grows ever long, and I’m sure, your patience short. My great friend A gave me my first Murakami book this year for my birthday. A Wild Sheep Chase is gut busting hilarious, and heart breakingly sad. Reading it alone set in motion my newest “author” fixation, and I have blown through a good portion of his works to date. So now, I sit (please consult the above picture for the exact positioning), reading his latest tome, and I am so inspired, and intimidated, and just plain breathless by what an extraordinary work it truly is. I am trying to take it slow, to savour the process, each page, each line, each word, each letter. But it is hard. So very hard. I have around three hundred pages left, and I am sure to be done before I know it. I am sure that I too, like the characters in the book, will be living in a slightly altered world, because of this work. Wow, I am so glad I’m not the only one who thinks that!! Haha. I can not WAIT until I graduate and can once again read the books of my own choosing. I’ve been trying to read for pleasure on the bus more often, because it’s hard to read in a “scholarly” manner when you’re being shoved around on the B-Line. 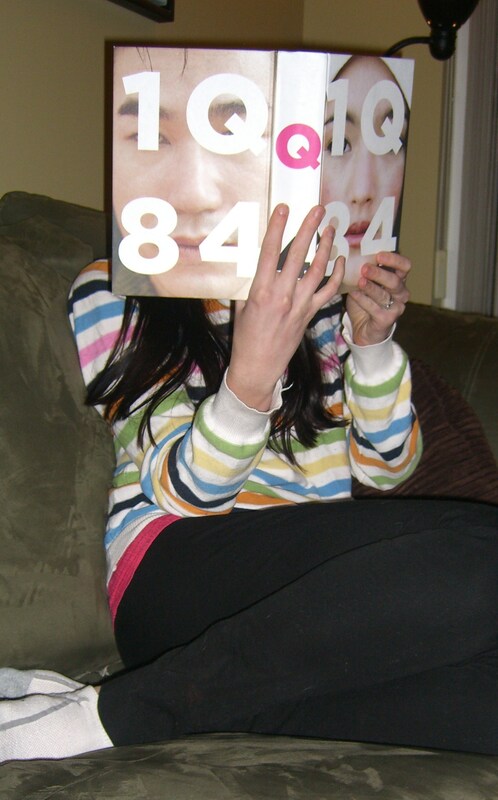 Also, I’m so glad you got 1Q84 for Christmas! I was hoping you would :) I gave it to my dad. I will be getting one for myself eventually (love the rice paper cover), but probably not until the spring when I’m released from coursework prison. 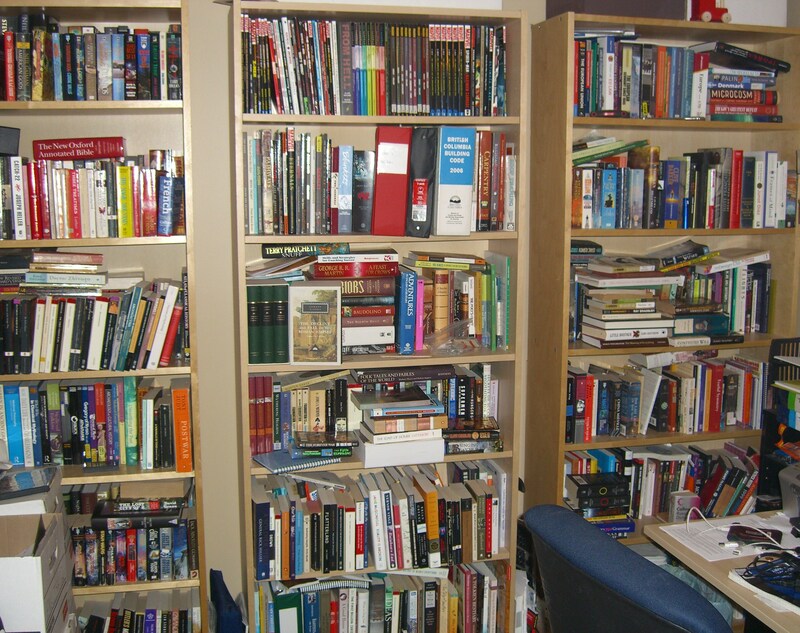 PS I just saved the photos of your bookshelf to my hard drive so I can pick out the ones I haven’t read and rectify! I had forgotten about Kit Pearson! Thank you for reminding me – I enjoyed a wistful Google and smile. PPS I’ve been reading The Catcher in the Rye and I smiled when I came across the line from your epigraph. Is it called an epigraph when it’s on a blog? Kit Pearson books were so awesome! A good step up from The Babysitter’s Club books of that era. haha. Do the schools still have “Book It” anymore? Maybe the kids will start reading more for pizza. 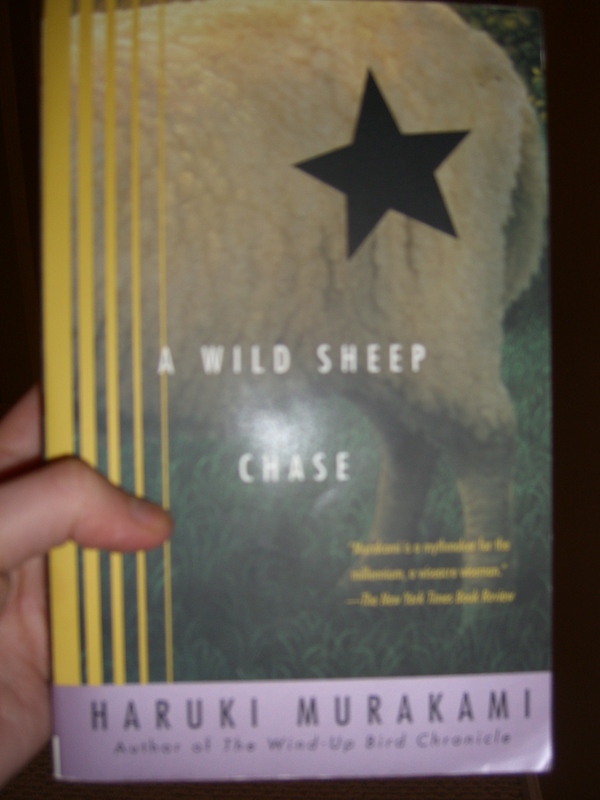 My reading list is always growing – I just added A Wild Sheep Chase to it. Thanks!